Fourth of July was full of some extra sparkle with the help of some glitter. I have been seeing this hall pass on Pinterest floating around and of course I decided to make one of my own. I am not too fond of writing students passes and this seemed like a simple solution. Pin a clothes pin on their collar and they are free to leave. With the left over clothes pins I decided to cover them with glitter and put magnets on the back of them for use on the white board. I am not the biggest fan of glitter due to the fact that once you touch glitter it will stay with you. I learned a tip on how to keep the glitter off you hands. Once the glitter is dry cover the glittery surface with decoupage. The decoupage creates a seal on the glitter. You sign turned out great! 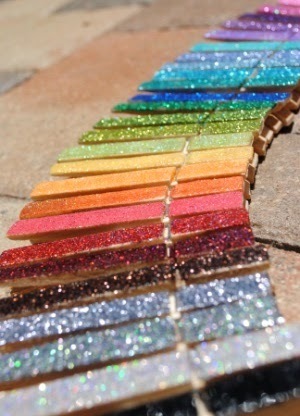 I love the rainbow glittery clothespins! Thanks Jennifer! They will certainly add some extra sparkle! 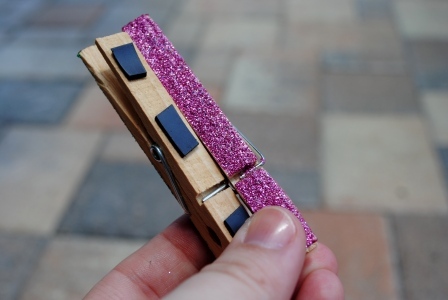 i just love those glitter clothespins. They're fabulous! I love the colors you used for your sign, too! Thanks Andi! Glad you enjoyed this! Thanks Tara! The clothes pins were really easy to make! Pretty!! Love how they turned out! Thanks Mrs. E! I was pleased how they turned out too! Love your hall pass! 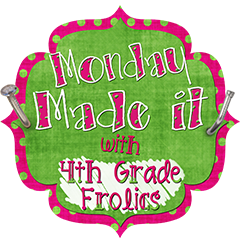 I made mine this week too! 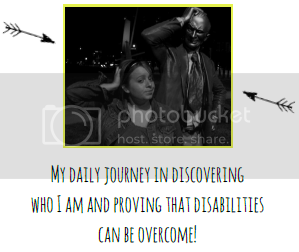 Would love for you to stop by my blog and check it out! Thanks! 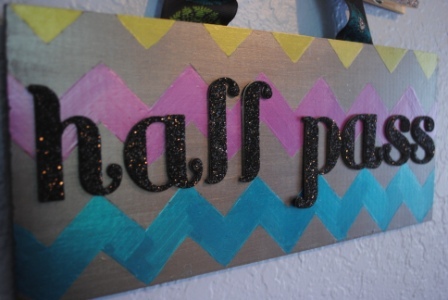 I think the hall pass sign will be a nice time saver! Thanks for the glitter tip! I am not a big fan of glitter! 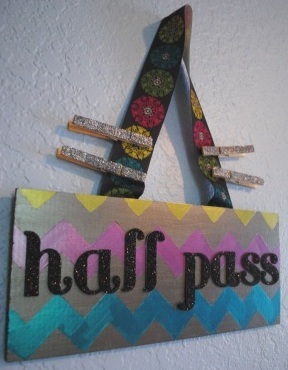 The hall pass is such a great idea. I am your newest follower. I would love to have you come by and visit! Thanks for stopping by! The decoupage tip makes me like glitter a little bit more. I will defiantly stop by for sure! Thanks Brittany glad you liked it! Thanks Jena glad you enjoyed it! This is great. Thanks for the tip about the glitter. Not a problem, the tip worked like a jem! I am not a teacher but I love glitter! These would work great on a fridge to hold notes and slips as well as keeping track of hall passes! Love the use of magnets on the glitter pegs. Have been looking for similar magnets here in Spain for ages. Could you possibly let me know where you purchased them? I would be eternally grateful for the information!!!!!!! The magnets were just on a roll similar to scotch tape. You might look at an office supply store. Very cute idea. I'm going to try it. I used a lanyard last year. I thought it would be great then the boys won't pee on it, it can't get dropped in the toilet. Well, my principal absolutely HATED them. She would always send my kids back to class with a scolding. I'll try something new this year. Maybe a little less dramatic will do the trick. يجب أن يكون لدى الشركة المتخصصة في نقل ملابس الكويت أفضل فريق متخصص يوفر خدمات نقل الأثاث بدقة وحرص كبير ، يتمتع بخبرة واسعة في هذا المجال ، وسيتبع أكثر الطرق ملاءمة لتحقيق مستوى عالٍ في مجال نقل الأثاث. Thank you for stopping by! Your sweet comments are appreciated greatly! Oh target you have done it again!